Swish and Stamp: Happy Day! It's definitely time to share another project with you guys! I decided on this card for Saturday Stampin' and I absolutely love it. The flower on this card is from one of my favorite sets; it's called "Mixed Bunch". It comes with three different flower designs but what I love most is that Stampin' Up! 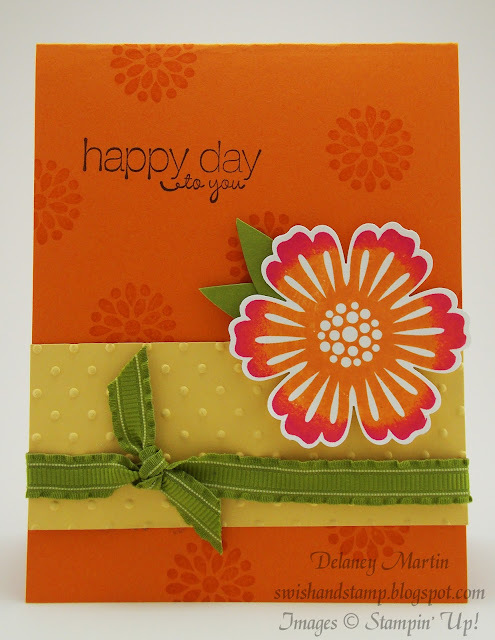 has an awesome coordinating punch that allows you to perfectly punch out the awesome flower you just stamped! It really is the easiest thing ever; so awesome! For the flower on this card, I used a technique I lovingly called the "Hula Hoop" technique. You stamp the entire image in the lighter color (in this case it's the pumpkin pie) and then you roll the edge of the stamp around a darker color (melon mambo). It's a fun circular motion that completely reminds me of hula hooping as a kid! It gives the image a nice dual color look, I think the bright colors of the flower really make this card pop. Also on this card, I used another great technique, and honestly I have no name for it. Ha! You see the cute little circular flower burst things on the base card stock? Yeah that's what I'm talking about. I used one of the circle stamps from Mixed Bunch and stamped it randomly on the Pumpkin Pie card stock in... wait for it... Pumpkin Pie ink! I know! Crazy, right?!? It gives some nice contrast to the background without being too fancy. I guess this card was just my attempt to try and get spring to hurry up and be here! Thanks for stopping by guys! Had fun making this card! On the flower, you can use a bone folder to slightly curl the flower petals up so they stand out and have a little '3D' look to them. Definitely a bright, fun card!